Helps to organize your laundry space by using every available inch – clutter free. Can put it into every corner of house. Product will be extended ONLY 87 inch WITHOUT installing connecting pole. What is strength of this product? Strong enough to hold up to 20kg without deformation. PE-finished wires to keep it clean. The height of the baskets can be changed as needed even after the installation. - The height of the baskets can be changed as needed even after the installation. - Baskets can be set upside down to carry larger boxes. 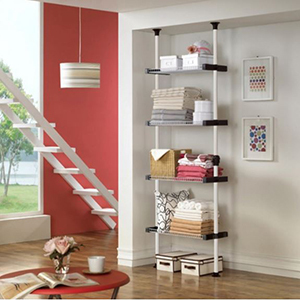 - Utilizing four wire shelves increases storage space. One Touch Fastener is our proprietary technology that makes it easy to install sturdy poles. Extending vertical pole toward both ceiling and floor. Shake vertical pole by hand to ensure the vertical pole set up firmly. ©Copyright 2017 by Prince Hanger All Rights Reserved.